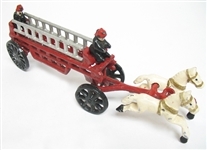 CAST IRON HORSE PULLED FIRE TRUCK. MEASURES APPROXIMATELY 9 1/2" LONG BY 2 1/2" TALL. IN GOOD CONDITION.